WordPress is a popularly used Content Management System platform that is hugely used to craft blogs, websites and also web applications. CMS lovers across the world are always fascinated by the WordPress platform for attempting to build their own sites with the help of this platform. WordPress CMS is recommended by expert bloggers due to its flexibility, easy to use, no coding skills required and lots of WordPress plugins availability. You can do almost anything by using WordPress plugins. It’s recommended to hire a specialized WordPress developer for offering your site an expert touch by evading common WordPress mistakes which can create your website un-trustworthy. If you are intending to set up your site yourself, the chances of making errors do increase. I’ve listed few common WordPress mistakes that you should avoid while building your site by your own. Though it is easy to install, the website that is developed using the default theme that may be mismatched with the necessities will create your site less trustworthy and unappealing thus overlooking many critical features provided by WP. You should actually research and evaluate the theme you select for establishing your site to bring the best from it. There are numerous marketplaces available on the net to buy WordPress themes such as Elegant Themes, MyThemeShop and ThemeForest. But if you want to use FrameWork then I personally recommend Genesis and Thesis. Loading time of your website is certainly a big issue, as it stands important for the real visitors as well as search engines. If your website taking high load time, your visitors can move to other distinct sites. Always choose a recommended WP hosting to avoid making this mistake as visitors appreciate quick loading website. The sites which open quickly rank better on search results page as well. Not caring about site loading speed is one common mistake that wordpress users often make. According to the research visitors, leaves a website that takes more than 3 seconds to load. So, the first 3 seconds are very important for any site. You can analyze your site loading speed with YSlow, GTmetrix and Google Page Speed Insight. You cannot ignore the importance of WordPress updates otherwise it may result in security exposure. If you are not caring about updates then definitely you are making a worst wordpress mistake. Whenever susceptibility or a bug is noticed, it approaches with a new update that you should pay attention. You should always update your WordPress with a new version As soon as possible because it is developed for a suitable reason and giving better features. Along with wordpress platform updates, you should take care of WP plugins updates. Users often make the common mistake of not crafting backup of their blog on the scheduled basis. You are suggested to have a backup of your website, mainly before doing an update. Anytime a disaster can happen, so make sure to have an entire backup of your website which is hugely vital for the web developers and owners. There are many best wordpress backup plugins are available in the WordPress repository. Some well known plugins are BackupBuddy, Backup WordPress, Updraft Plus and WP Database Backup. You might also like: 10 Best WordPress Backup Plugins. A user can manage the website visibility very well which is an option given. But by chance in a hurry they can even forget to verify whether their site is noticeable to search engines or not. Due to a wrong click, your site may not be visible to search engines and cannot be graded till it is corrected. You can enhance the search engine visibility of your content by learning SEO techniques and also by setting up WordPress SEO by Yoast plugin properly, which is known as best WordPress SEO plugin. One most common mistake is owners might forget to remove taglines or dummy contents from the site. They may overlook to modify the tagline that is by default in the WordPress as an additional WordPress website. When dummy contents or sample posts are not removed they can be indexed by the search engines and begin approaching on your sites. If your search for the term “another sample page” you will find millions of sites have sample page. So, you should remove this useless page after installing wordpress platform. WordPress has a big library of plugins, this is a great advantage. But with the use of too many plugins(worst coded), it may hamper and create a conflict with each other. Thus, it may lead to your site working slowly with less non-functioned segments. Before installing any plugin, you should care about its reputation otherwise you may fall into trouble. Always try to use well coded and well known plugins. Many developers completely forget to make their websites responsive that stands as hugely important for not losing mobile users. Hence, you should either craft a responsive site or mobile your site with the use of WPtouch plugin. With responsive design technology, your website looks remarkable on mobile though it has a small screen size. Also Google, A giant search engine already announced they preferred mobile optimized websites in mobile searches. The owners or developers may not find it vital to look after the contents of their website. The quality of the content should be maintained which helps in better ranking. So you should make sure that your contents should be creative, nicely organized, correct grammar, and engaging to the readers. And one more important thing is your content really help readers and not just filling the space of your website. Publishing useless and fake content is one common mistake to avoid. In the integral WordPress options, it is viewed that many people utilize the default URL structure that should not be applied. You shouldn’t utilize permalinks as they are as they may out an effect on your user experience and SEO too. Your URL permalink structure should be clean and descriptive that help users to understand the URL actually about what. For example; look at the URL structure of this article. The above URL structure clearly helps users to understand the topic which is linked to it. This structure approaches best for both readers and search engines. You can setup a clean permalink structure by going to your WP dashboard>Settings>Permalinks and choose Post Name option. 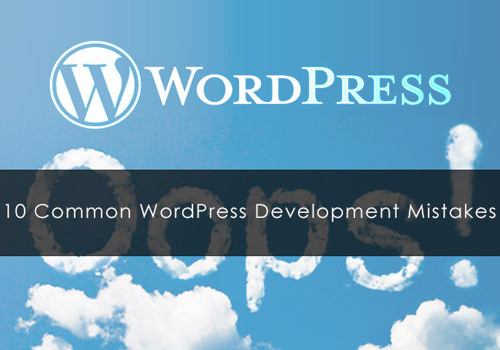 Hence, after going through the 10 most common WordPress mistakes, I hope you won’t be making any such mistakes further. Of course, do not forget to take the support of digital marketing company who can give their best in establishing excellent websites for you without any mistakes! This is a guest post written by Juana, a content developer and loves to share WordPress tips. She wants to visit Paris in her life. She works with Essay.com as a freelance content developer.